It’s no secret – one of my greatest passions is being a part of a solid team that daily leads our amazing Jenison district. But the enjoyment doesn’t stop there… the final bell rings and our students move on to find their passion and pursue excellence in other areas. There is no shortage of opportunities to watch our students shine! It might be said that my favorite Jenison event to attend is, wherever I happen to be that day. And yesterday, as Michigan’s winter weather reappeared, it seemed appropriate, that I spent the evening at Griff’s Georgetown, attending the Hockey Kids Night game. 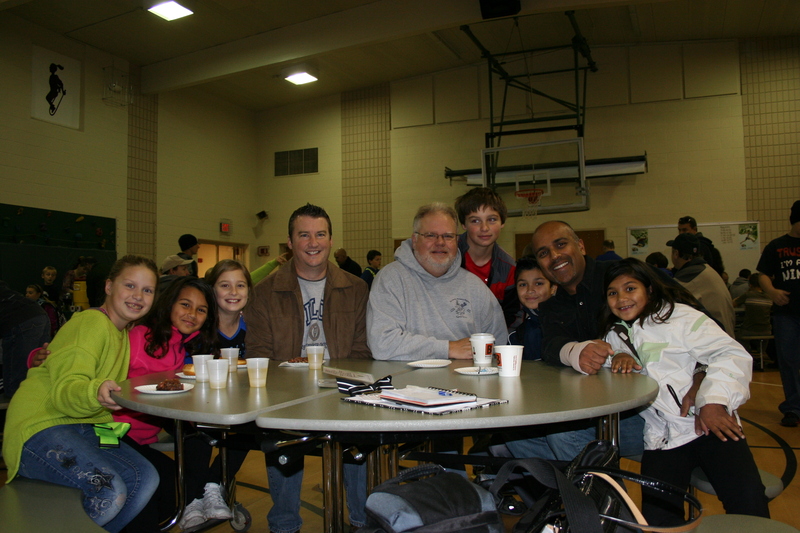 It was a great time for students and their families, with a lot of fun activities planned. It also gave me a chance to get on the ice and compete in the frozen turkey toss game! This is the 22nd season for Wildcat Hockey; about 10 years ago, the team developed into a Co-Op combining players from Jenison, Zeeland West and Zeeland East, and they are putting together a highly successful season. Shortly before Christmas, they skated away as champions of the Holiday Classic Tournament. Last night, was particularly exciting as they fought hard for a big victory in the final seconds of the game. Mirroring the Jenison Varsity Football Kid Cat program, our Hockey players were partnered with elementary classrooms and have spent time reading with our younger students. The team has also hosted multiple “Kids Nights at the George” giving families a fantastic opportunity to enjoy an affordable night out and see some awesome Wildcat action on the ice. Jenison Varsity Hockey Players Noah Sheldon & Jack Williams visiting and reading with the students in Jenny Dudick’s ECC classroom. They are about 2/3 of the way through their season and if you haven’t made it to a game yet this year, don’t worry! Hockey players will be back in classrooms on Friday, January 25 and will host their final Kids Night that evening. 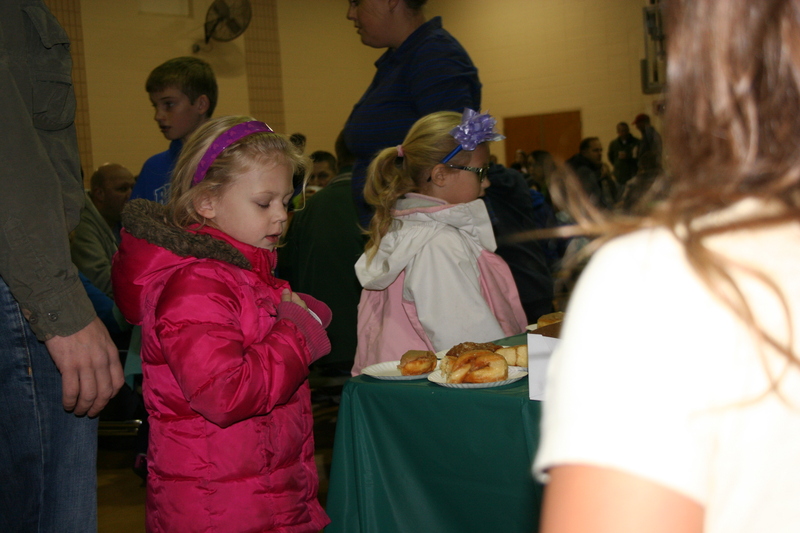 Elementary students are free, concessions are tasty and more great activities are planned! It gives me great joy to see our community of families and teachers take pride in and rally around all of our student performers (sports, fine arts, clubs, et al). Mark your calendars and keep scrolling to check out photos, media coverage of the team and the remainder of their schedule. Don’t miss the chance to support this awesome group of guys! Never know who might be at a game! Spiderman was an excellent cheerleader and got the crowd pumped with a tee shirt toss! Check out some other local media coverage of the 2018/2019 Jenison/Zeeland Varsity Hockey team. Click HERE for the complete Jenison Varsity Hockey Schedule. Over the course of our summer we will feature various artists and art pieces from each Jenison elementary school as well as the Junior High and High School. Each piece was carefully chosen by our art teachers and we hope you will enjoy the talents and hard work of our students while you also enjoy a beautiful and relaxing summer! During this unit on “Op Art” students studied various artworks which displayed an optical illusion. We discovered that creating the look of a 3 dimensional object on 2 dimensional paper is in fact an optical illusion. Aurora divided her square paper into 8 sections. The first part of the illusion occurred when Aurora created curved lines within each section, giving them shape. These stripes were then colored with colored pencil in an alternating pattern. Aurora then used a shading technique which gives the artwork the appearance of being 3 dimensional. Aurora was patient and careful with her pencil strokes as well as the varying pressure necessary to create the illusion. This project was tedious at times, and Aurora’s persistence paid off with a beautiful result in this artwork. Aurora and her artwork were selected by her Pinewood Elementary art teacher, Ginger Brown. For this project the students learned about the the three different types of communities. The students examined the similarities and differences between the different types of communities. Then they went on to design their own mixed media community! First Dylan drew his imaginative community in pencil then he outlined his drawing with sharpie. Then went on to complete his community by painting it with watercolor. The students also learned about Vincent Van Gogh and color theory while creating this project. The students demonstrated their understanding of color theory by creating a background with a color scheme of their choice. Dylan used warm colors and white to create in Starry Night inspired background. His community painting was then collaged on top of his Starry Night background to create a beautiful masterpiece! Dylan is a very creative and talented young artist whose artwork always stands out. I love his imagination and his ability to think outside the box. Dylan said his favorite part of this project was designing his city and using the metallic paint on the stars. Dylan is a very hard worker and I cannot wait to see his future creations! Dylan and his artwork were chosen by his Pinewood Elementary art teacher, Ashley Hankamp. Last Friday morning, the Pinewood gym buzzed with the kind of excitement that only comes when dads give two thumbs up to sugar in the morning. 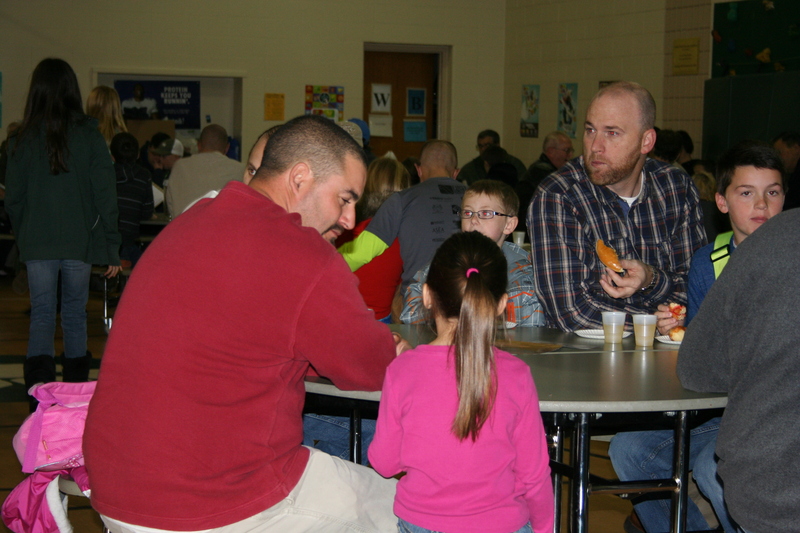 Because at 8 a.m., dads and sons and dads and daughters filed into school, ready for a little extra time together before classes began. 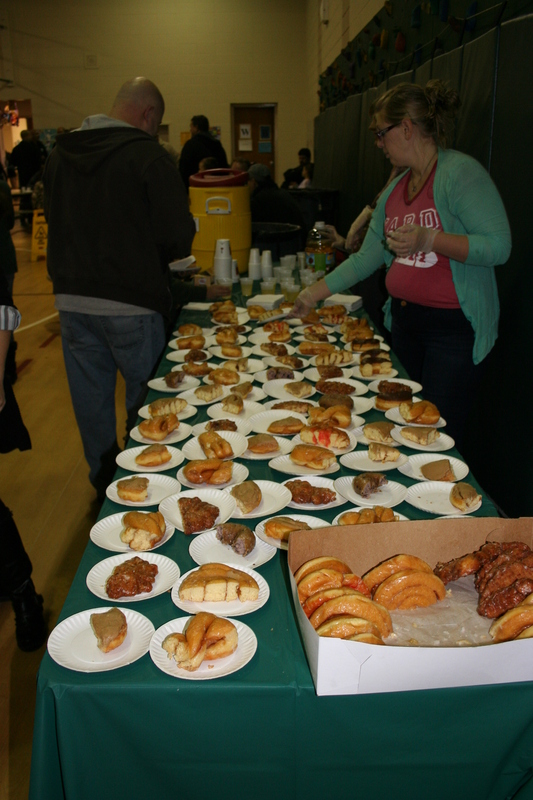 With twenty-two dozen donuts ordered and over 275 RSVP’s, Amy Perrien, coordinator of the event, prepared herself for another year of smiles and laughter. 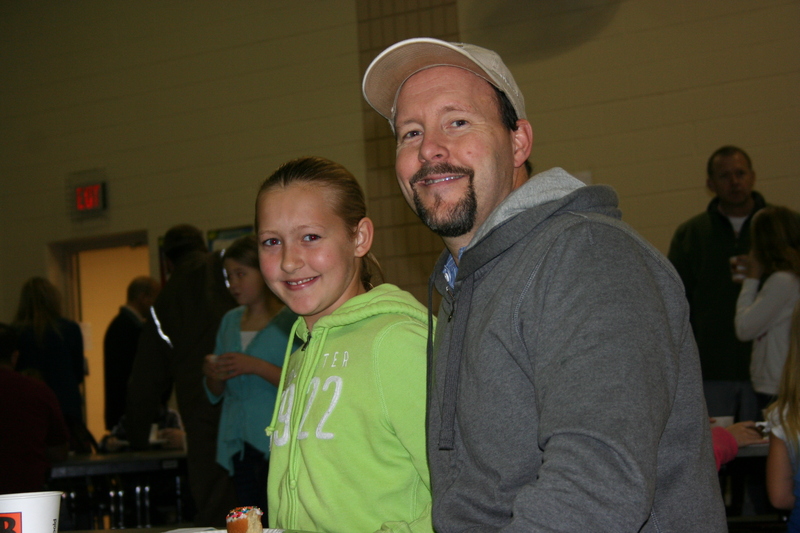 “Donuts with Dads is a great time to hang out with your child and enjoy the fall — and it’s the right time of year for donuts. We love providing the opportunity to do something fun with your child at school!” Amy said. If you were invisible where would you go and what would you do? With family members snuggled close, we knew that the donuts weren’t the only sweet thing in the gym that day. Sweeter yet were the relationships being strengthened by the simple act of sharing breakfast. It may have been the bananas and apples that got them going after school, but it was certainly the encouragement they received from Principal Rachael Postle-Brown that kept them moving forward. That’s because these students are staying after school with a goal: to increase reading fluency and mathematical know-how. And they’re doing it with the help of dedicated volunteers from Grand Valley State University, parents, and their principal. 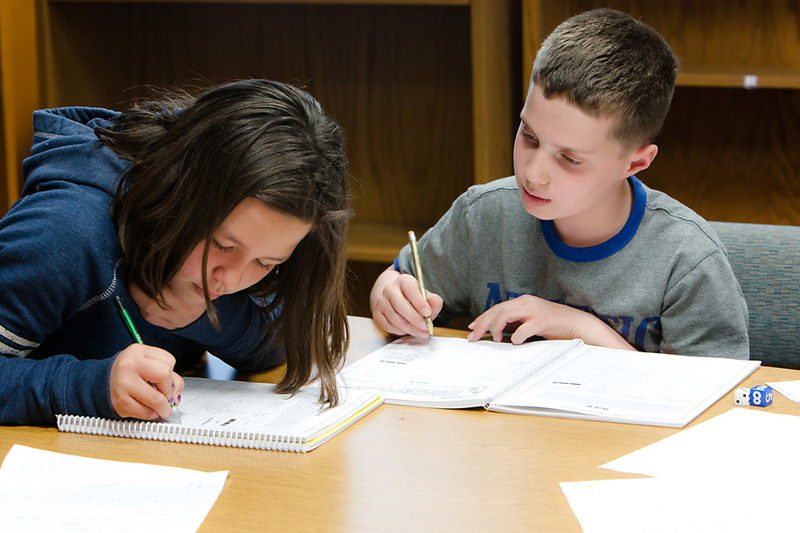 Pinewood Elementary School’s math and reading support groups offer the additional academic practice some students need to hone skills and solidify new concepts. They explore strategies covered in class but approach them in new ways to increase their staying power. Using dice to conceptualize mixed numbers and working with number cubes to reinforce the significance of numerators and denominators were just two of the activities planned for this session. Principal Rachael Postel-Brown works with math students after-school. While students whose learning styles are more tactical and hands-on appreciate the a more creative take on math, Mrs. Postel-Brown says it’s not just the techniques employed that help make the math stick — it’s the fact that parents are involved in supporting the process. 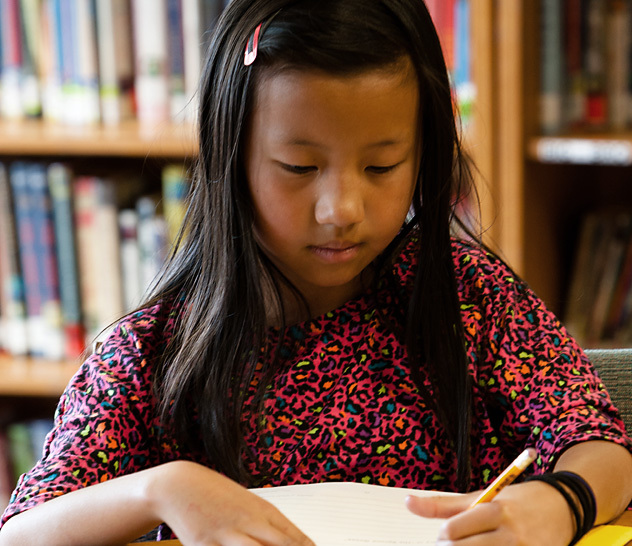 The other component of the academic after-school program is focused on reading fluency. Mark Boersma, a Master’s Student at GVSU, uses the Read Naturally curriculum to help strengthen comprehension and reinforce the use of expression in reading. Mr. Boersma works with a student on reading fluency. Over in the Pinewood gym, Dee Perry is providing care and individualized attention to kids in the before- and after-school program. Affectionately called “Mrs. D” by her students, this beloved woman spends her energies not on academics (although they do read many books! ), but on childcare. We applaud the dedicated time and effort that these adults invest in the lives of our students! They are indeed helping to shape our future!